Mothers have many duties to fulfil and tasks to perform around the home. It’s important for us to take steps to do what’s best for our kids. I have recently started the process of decorating my child’s room. 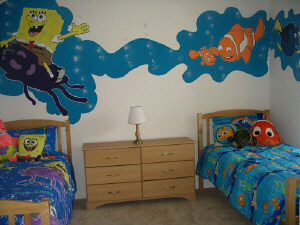 I think it’s important to have a comfy room whether you’re an adult or a kid, and this starts with decorating. And I had to make sure that I was careful to do this in a safe but effective manner. The last thing I would want would be for anything to become damaged and pose a risk to the kids. Now, this only applies if you have a newborn – if you have older kids just replace cradle with bed. The concept is still the same! Basically, whatever you’re doing in the room, you have to make sure you leave plenty of room for the cradle. It should sit in the centre of the room, and you need to be able to walk all the way around it. This is going to be crucial if you need to get to baby quickly and from any angle. So I made sure I kept this in mind before I did any decorating in the room. I think wallpaper is an important part of a child’s room. It plays a big role in the decoration and their enjoyment and perception of the room. Young children like bright colours, and they need stimulation. And by making sure you have brightly coloured wallpaper with patterns or animals on it you provide this. There are many sections of stores that will stock wallpaper for kid’s rooms, and you can always look online as well. A kid’s room should be bright, and inviting. Nobody wants their child to be stuck in a room that is gloomy and murky. This isn’t going to help with their development or their mood. So try to make sure you do as much as you can to get a bright room. You need to make sure you work on the lighting. I like to make sure the main light is as bright as possible in the kid’s room. Then I make sure there are a couple of table lamps too. You might want to think about a nightlight in case the children are scared of the dark. Because I’m a mother I like to add homemade trinkets to the kid’s rooms for decoration. This lets them know I’m always with them and adds to the decorative appeal of the room too. I like to use crafty bits that I make over weekends. I get a load of materials and some Henkel hot melt adhesives from Kenyon Group, and I have fun all weekend creating things. This is a brilliant use of time, and it provides me with little personal items I can use to decorate the kids rooms. As a mother, I have to make helpful decisions for the good of my children. That means that I need to take steps to do what’s best for them at all times. So, when it comes to decorating my kid’s room, I know what steps I need to take. And you need to know as well, so you too can decorate their rooms in a safe but effective way.